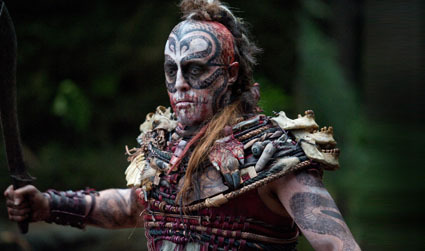 "Cloud Atlas" is a story that spans nearly six hundred years. In the foreground, it is a mixture of six personal stories, while the overall arc tells us about the phases in the rise and fall of a global corporate monopoly. Meaning, the film takes us through this one large story, that slowly unfolds in narration by six distinct, yet interwoven threads, identified by the year each story launches. You need not remember the year - I am recalling them from internet links - but as you watch the film, you will definitely get a sense of each divergent era. 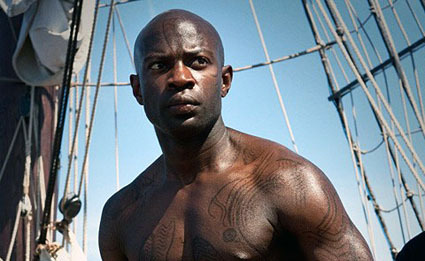 One - 1846 - is the story of passengers on a ship, specifically the son-in-law of a slave trader, discovering a stowaway while becoming almost fatally ill. Another, 1931, is the story of a composer who leaves his soulmate and their taboo relationship to work for an established composer on what intuitively becomes their masterpiece. Another, 1974, is the story of an investigative journalist living in the shadows of the memories of her father, while uncovering a massive corporate conspiracy. 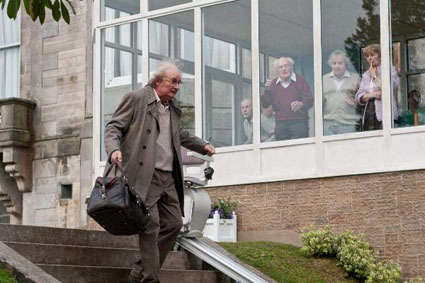 The next, 2009, is a story of a curious elder publisher seeking escape from a punishment of incarceration in a nursing home. The next, 2144, is a story of a genetically engineered stepford-wives-ish diner waitress getting exposed to her unique humanity, while discovering an even larger corporate plot. The last, 2346, is the story of a post-apocalyptic hunter-gatherer, who meets a woman from space, in the search for hidden clues to the world's history, hidden in a frightening temple. As the stories unfold, we see that the stories are related, and imagine further connections that might or might not be there. 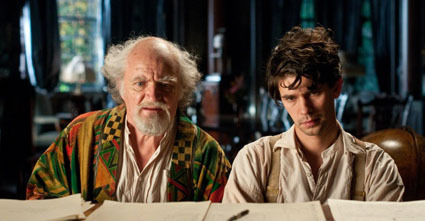 Now, to understand the overall story, consider each of these threads to be telling you the story of "Cloud Atlas," almost as though they are talking heads, narrating the overall story through moments within their own stories. We all understand this method already, for every movie tells you its individual stories in this way. Unless we are watching a film in some sort of real-time, like Hitchcock's "Rope" (1948) or Richard Linklater's "Tape" (2001), most every narrative tells us its story, not through a continuous chain of cause and effect, but instead through a collection of moments. We then understand links between these moments as the narrative. But to further understand this story, I suggest the following six keys. This film repeatedly makes mention of keys, usually for liberation of some sort, and I offer you six keys to help understand this magnificent film. First, understand the methods of Howard Zinn's "A People's History of the United States of America." Most history books tell us the stories of political transformations, and their subsequent effects on society; they are often the stories of kings, battles, and institutions. Zinn's approach is to look at the personal stories of those people who worked toward social transformations, placing the political changes as wholly relevant, yet sort of in the background. And, this technique is the approach that guides the individual threads of "Cloud Atlas." Now, this is not easy. Part of the reason that history books tell us about the political changes is that those stories are far more interesting than the stories of lay people. But, the stories we watch in this film are not only compelling and exciting, but stylistically very different from each other. Second, understand the techniques of a sextet. Above, I mentioned that we should look at each of the six threads as narrators of our story. It might be easier to understand this point by imagining the film as a concert performed by six separate musical instruments. More than that, consider an orchestral work composed of six interwoven movements. We are familiar with that urban legend dictating that Pink Floyd's "Dark Side of the Moon" synchronizes well with "The Wizard of Oz." 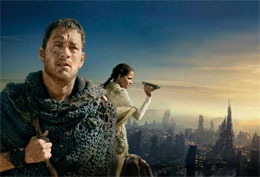 I expect, either as reality or as urban legend, that "Cloud Atlas" synchronizes - scene by scene - with some three-hour piece of classical music. Third, "Run Lola Run." While this film is very much a Wachowski film - so much so that thread 2144 seemed like a prequel to the Matrix saga - Tom Tykwer's 1998 film also seems present at some level. There is the overall question in the film of destiny: are we able to choose our actions, and if so, what effects do they have on the rest of the world? According to the film, the greatest choice is the choice to be the person you are. This film adds a series of censors compelling our characters into some sort of social conformity. Almost all of these censors are played by Hugo Weaving. At times, he is a greedy opportunist with giant sideburns. At times, he is a corporate hitman in a trenchcoat. At times, he is the Devil in a top hat. At times, he is a ruthless warden in the body of a frowning nurse. 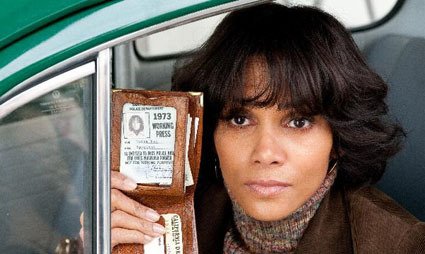 Fourth, continuing this point, the plot(s) would be far more coherent if the same (mostly big name) actors and actresses (primarily Tom Hanks, Halle Berry, Susan Sarandon, Jim Broadbent, Hugh Grant, Keith David, and Weaving) were not re-used for almost every thread. For much of the film, this makes for a very distracting process. Initially, the most confusing is Tom Hanks. 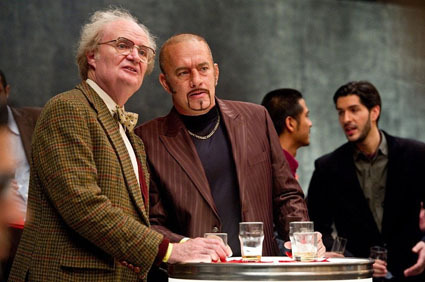 I realized watching this movie that Tom Hanks is our generation's Jimmy Stewart. When he appears on the screen, we expect him to be a very sympathetic protagonist. And, Hitchcock - succeeding Frank Capra as one of the great sources of the Jimmy Stewart good-guy mythology - turns that on its head in "Vertigo." I hope you understand my suggestion. But, there is a method here in having the same actors and actresses play multiple characters. Fifth: liberation is a liberation from all boundaries. With the students I am training in Islam, one of the first texts we frequently study is a short, deceptively simple tenth century book called the "Creed of Imam al-Tahawi." And, one of the first lessons I teach from that book is that God is not bound by anything, and is not bound by being not bound by anything. In "Cloud Atlas," however, the point is that true humanity is not bound by anything, that your true self is locked in a series of cages. The first cage is your gender. The second cage is your set of personal demons. The third cage is the warden (that might be disguised as a beloved). The fourth cage is society, with its institutionalized restrictions (often on appropriate and forbidden relationships). The fifth cage is time, whether we speak of the pervasive presence of each soul through the six centuries, or our need to watch this story in chronological order. And, the sixth cage of life is life itself; characters free themselves from the constraints of life in each of the ways you would imagine. All of our central characters seek complete liberation from all constraints. But, the true liberation is to be able to live that life that they cannot, not live. The true life is the life composed of choices that they cannot, not make. Thus, the same actors and actresses reappear because they are, essentially unbound by the constraints of gender, self, institutions, society, time, and life. The characters, when they discover truth, recalling the light outside of Plato's Cave, they are transformed, and unable to return to their former selves. In watching this film, I felt that if the Wachowski's remade "The Matrix Revolutions" (2003), they would not cast Mary Alice as the new "shell" of the Oracle, but would instead cast a man. More deeply, in watching this giant epic, I felt that I was watching a very touching, intimate story of Lana Wachowski, seeking to be the person that she could not, not be, seeking to release herself from the cages of the above constraints. As someone who has lived a life in almost every form of exile, I found myself sympathizing with her, far more than I expected. Sixth, and this point might be the most unsatisfying for some critical viewers: we have an innate need to bind and connect. 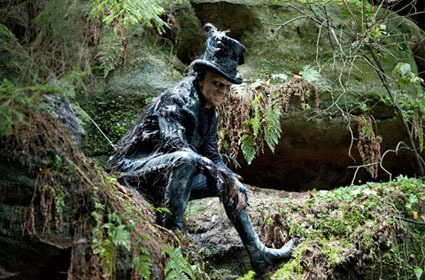 Each viewer experiences this in consciously, but especially unconsciously trying to derive connection between juxtaposed scenes or frames in any film, but especially this film. But, consider how deep this tendency is. Anytime we find two consecutive items, we unconsciously create a link between them. When you sit in your car in front of a stop light, the light switches from red to green. These are two completely different processes. The red light shuts off, and the green light activates. But, in our mind, we understand the change as a shift from red to green. This sense of shift is even more apparent in the reverse, when the light "shifts" from green, to yellow, to red. Another similar illusion is the cutaneous rabbit illusion. Here, if someone taps a finger along the length of your arm, you will feel as though movement is taking place, almost as though something is hoping on your arm. This tendency to create these links is innate in our neurology. So, is there are a relationship between the scenes? The answer is of course yes, and of course no. We automatically get a sense of progression when we jump from scene to scene. But, we can, however, detect a series of waves, where a cluster of scenes do connect with each other structurally and thematically. Liberations take place simultaneously. Exposures to truth take place simultaneously. Transformations take place simultaneously. Love is lost and found simultaneously. On the flipside, perhaps there is no relationship between the scenes: it might be that I am sharing the themes as I have constructed them in my mind. I will not know, until I see the film again. Now, beyond this point, the film's ultimate binding force, binding together the entire galaxy, is true love. But, anyone who knows the Wachowski films, already knows this point. The whole "Matrix" trilogy leads us to this point. As is true in the "Matrix" films, the true love this film seeks is unbound by any constraints. Here, lust also becomes a constraint against love. This movie, however, takes love further. In some of the threads, that true love is a deep love between two equals. In some of the threads, it is the love of a parent and child. In some of the threads, it is the love of the rescued for a rescuer. In some of the threads, that love is loyalty to fellows or humanity. 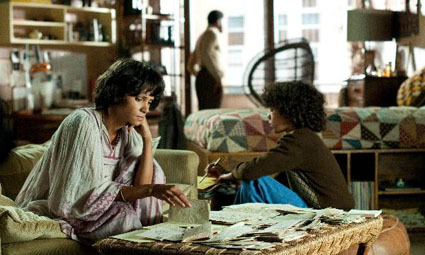 But, the love of "Cloud Atlas" is not merely something rational, antiseptic and platonic. Rather, it is compulsive. Again, it is a love that someone cannot, not have. In Rumi's language, it is fire that ignites life. It is not mere wind; it is fire. And, anyone who does not have this fire, need not be alive. In the film, anyone who does not have this fire, has probably surrendered his/her humanity to the above-mentioned cages, waiting to be devoured by the conspiratorial system. That love is something that reaches into the most intimate places of your being, and cannot exist without connecting with someone else. That love becomes something produced by the two of you, yet not belonging to either of you. It is a greater work of art than even a masterpiece composition. So, the film is ultimately asking if you have ever experienced that true boundless love. I do not think that I knew love until the births of my daughters. Until they arrived, I was essentially an ascetic of sorts, detached from the world. And, they arrived and became my world. And, through them, I was exposed to love in all directions. I think every parent understands this. And, when I follow the story of the two Wachowskis, I find myself thinking that I am witnessing a special, true love between two siblings. In another time and place, a related pair would have split. I wonder, though, how many of us find that fire of love in another person, where physical union becomes a taste in that transcendence. And, what do we make of that corporate presence in the background. At first, we watch slavemasters profiting off of humans. Then, in the next thread, we observe members of that high society, discarding their sense of dignity. Then, in the next thread, we observe a business that is capitalizing off of nuclear disaster, followed by a culture, again of high society discarding the dignity of its elders. Then, in the final two threads, we witness the final conquest of the corporate monopoly, eventually vanquished by the cult of a martyr. And, society starts all over again, ignited into place by her love for humanity, and, the last couple's love for each other. Now, critics of this film will consider it to be rather pretentious. Such would also be the complaint against the Wachowski's Matrix trilogy. But, in those films and in this film, I remained absorbed and entertained. And, in this film, I was touched down to the depths of my being. I found myself wondering wondering wondering, if that true love really does exist between two lovers, with such depth as the burning intensity of my love for my daughters.